Sophie Koh will present an intimate performance showcasing songs from her upcoming new album at the Kew Court House on 11 November. The pop singer-songwriter will be joined for the first time by Ladychoir for this special, never seen before collaboration, offering something fresh and new for the audience. Koh has delved into her past, exploring influences from her Chinese heritage, her roots in classical music, and her time living in Singapore, New Zealand and Darwin. The result is Koh’s upcoming album Book of Songs, to be released in 2017. This body of work is where East meets West and is made up of pop songs that are influenced by Chinese poetry and performed on Western classical instruments – grand piano, viola and cello – without drums or bass. Her most recent album, Oh My Garden, was produced in LA with Brad Wood (Placebo, Veruca Salt) and includes collaborations with indie-pop sensation Ben Lee. Now, in Book of Songs, Koh explores her own identity as a Melbourne-based, New Zealand-born daughter of Malaysian-Chinese parents. Her Kew Court House performance will see the evocative musician speak about her journey and what this new music means to her. Accomplished string players Caerwen Martin and Louise Woodward join Koh for the show, while Ladychoir provides luscious choral backing vocals to the set. Koh is herself a member of Ladychoir, an all-star female group of critically acclaimed Australian singer-songwriters: Angie Hart, Emma Heeney, Tash Parker, Tess Hildebrand-Burke and Kirsty Joosten. 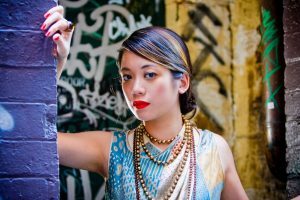 Koh first came to prominence after being ‘Unearthed’ by Triple J in 2003, when she was living in Darwin. She has since toured around Australia and supported artists including Paul Kelly, The Go-Betweens and Pete Murray, amongst others. Koh was awarded Best Female Artist in The Age EG Music Awards in 2008. The Kew Court House is a small performing arts venue presenting curated seasons featuring some of not only Melbourne’s, but also Australia’s, most prominent and exciting artists. A former courthouse and police station, the heritage-listed building presents one-of-a-kind music experiences that you won’t get anywhere else in Melbourne.